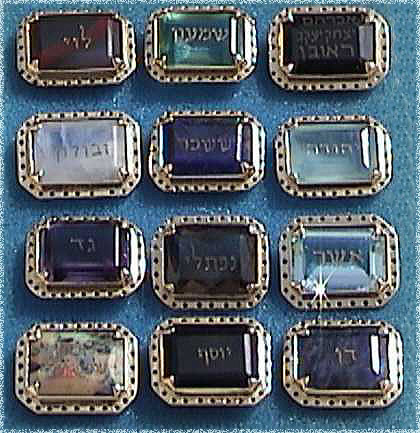 God used crystals or stones as a way to communicate with the Jews with the breastplate and Urim and Thummim that the High priest wore. Exodus 28:15 ‘Fashion a breastpiece for making decisions – the work of skilled hands. Make it like the ephod: of gold, and of blue, purple and scarlet yarn, and of finely twisted linen. 16 It is to be square – a span long and a span wide – and folded double. 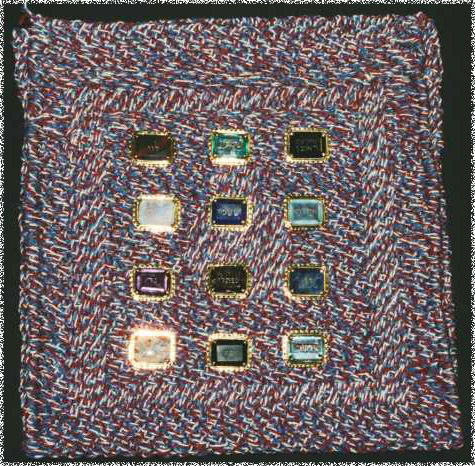 17 Then mount four rows of precious stones on it. The first row shall be carnelian, chrysolite and beryl; 18 the second row shall be turquoise, lapis lazuli and emerald; 19 the third row shall be jacinth, agate and amethyst; 20 the fourth row shall be topaz, onyx and jasper. Mount them in gold filigree settings. 21 There are to be twelve stones, one for each of the names of the sons of Israel, each engraved like a seal with the name of one of the twelve tribes. Note: The breastplate was designed to give the light of knowledge of the glory of God. That’s the purpose of the twelve stones in the breastplate; the man who wore this breastplate was a direct and anointed representative of God’s light of knowledge and the glory of God. It was to be respected with all reverence. 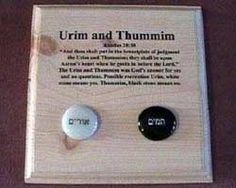 What do Urim and Thummim mean? Light and Perfection -representative of God’s Light and His perfection of which the stones reminded all Israel when the priest was speaking for God. This is part of the description of a Christian’s Armor of God. If you read all of Ephesians 6 you will understand that the Armor of God is to protect us from the war we are in with Satan. As believers we have a breastplate of Righteousness, whereas the O.T. Priest had a breastplate of Judgment. The Bible says that we have been justified and redeemed and therefore we are not under the condemnation or judgment of the law. Since we have been freely given the righteousness of Jesus, the Great High Priest, I believe that we are wearing a different type of priest’s covering than the one found in the O.T. law. Now lets talk about Satan’s breastplate, yes even he has one too! Ezekiel 28:12 “You were the seal of perfection, Full of wisdom and perfect in beauty. 13You were in Eden, the garden of God; Every precious stone was your covering: The sardius, topaz, and diamond, Beryl, onyx, and jasper, Sapphire, turquoise, and emerald with gold. The workmanship of your timbrels and pipes Was prepared for you on the day you were created. 14“You were the anointed cherub who covers; I established you; You were on the holy mountain of God; You walked back and forth in the midst of fiery stones. 15 You were perfect in your ways from the day you were created, Till iniquity was found in you. Satan’s breastplate only had nine stones in it, not 12 like in the O.T. breastplate, and they are also in a different order. Satan was an Anointed Cherub, he was the highest of all Angels. It is believed that Satan was in charge of music and was to direct all the worship and praises to God. Then he decided he wanted these praises for himself, and because of this Satan sinned and was cast down to the Earth. Satan is wanting to be worshiped, and this is one of the ways he uses crystals, stones, gems, amulets, or talismans to do it. No matter what you call them they are essentially the same thing. Satan has devised a way to take something that God created, beautiful mineral structures for good, and turn it into evil. Let me be clear the Bible NEVER assigns mystical or magical properties to crystals. Crystals are used in the practice of crystal healing, a pseudoscience that purports to heal various ailments. According to crystal healers, the careful placing of crystals on a patient’s body is supposed to line up or stimulate the body’s chakras and promote healing. The crystal healer/medium/shaman/reiki master might also use the colors of the chakras to determine what crystal to use, they may also use them in the form of dowsing. Dowsing is using a crystal as a pendulum at the end of a string or chain. They hold the pendulum in the air and ask the crystal a question, depending on the movement, this will determine the answer, this is divination. God is clear about divination Leviticus 19:26 ‘You shall not eat anything with the blood, nor shall you practice divination or soothsaying. Crystal healing can be dangerous spiritually, since this is a practice that calls upon powers to heal that are not from God. People put their hope in a crystal to heal them, or even the “crystal healer”, who “channel” and rely on the crystals to heal. Unfortunately, they are relying on demons for the healing. Even if they claim that they are using the crystal to direct physical energy flow to help bring “balance” (they are referring to chakras and awakening the Kundalini spirit), it is rooted in the spiritual realm, meaning there is a demonic source working behind it. Ultimately, this is considered an occult practice, which God clearly tells us to stay away from. Any form of healing that contradicts Gods Word is not from Him! Satan has taught people that crystals have an inherent power that can be harnessed and used to their benefit. The truth is that the crystals have no power in and of itself but, Satan uses them as vehicles through which evil spirits choose to work to open up the participant and enhance spiritual contact. People also use them to put upon their alters or high places to harness or bring in a good “energy” and collect bad “energy”, this “energy” is demonic, there is nothing good about it. They are inviting demons into themselves and their homes. None of these superstitious beliefs about crystals come from the Bible. The Bible does not say that crystals are beneficial for attracting wealth, channeling energy, healing, bringing good luck, rekindling romance, protection, or warding off evil spirits; neither does it say that crystals are needed to connect to God’s Spirit. On the contrary, the Bible warns strongly against engaging in anything related to superstition and the occult. God declares the practice of the occult an abomination and witchcraft is named along with idolatry as ungodly behavior. Deuteronomy 18:10 There shall not be found among you anyone who makes his son or his daughter pass through the fire, or one who practices witchcraft, or a soothsayer, or one who interprets omens, or a sorcerer, 11 or one who conjures spells, or a medium, or a spiritist, or one who calls up the dead. 12 For all who do these things are an abomination to the Lord, and because of these abominations the Lord your God drives them out from before you., The use of crystals as charms, amulets, or talismans is a type of occult practice, however benign it seems. Anything that seeks to manipulate the spirit world can be categorized as witchcraft. Amulets or Talismans are other words for crystals or gems that were historically put into jewelry. The majority of them derived their supposed power from the fact that they either bore the images of idols or were consecrated to idols. They were often engraved with an image or the name of a deity or demon. These magical charms were often worn as necklaces, earrings, or rings. Ezekiel 13:18and say, ‘Thus says the Lord God: “Woe to the women who sew magic charms on their sleeves and make veils for the heads of people of every height to hunt souls! Will you hunt the souls of My people, and keep yourselves alive? 20‘Therefore thus says the Lord God: “Behold, I am against your magic charms by which you hunt souls there like birds. I will tear them from your arms, and let the souls go, the souls you hunt like birds. 21 I will also tear off your veils and deliver My people out of your hand, and they shall no longer be as prey in your hand. Then you shall know that I am the Lord. Genesis 35:2 And Jacob said to his household and to all who were with him, “Put away the foreign gods that are among you, purify yourselves, and change your garments. 3 Then let us arise and go up to Bethel; and I will make an altar there to God, who answered me in the day of my distress and has been with me in the way which I have gone.” 4 So they gave Jacob all the foreign gods which were in their hands, and the earrings which were in their ears; and Jacob hid them under the terebinth tree which was by Shechem. Talismans were historically associated with astrology as well. Let me be clear Astrology is another form of the occult. Ancient works on astrology, written in Sanskrit ( 400 BC.) describe the demonic “power” of stones. In those days astrologers advised people struck with misfortune to wear different kinds of stones to counteract the “negative effect” of the planets. This occult system is interconnected to the Zodiac and have hidden “powers” for “healing” the body as well as the emotions and spirit. Perhaps this is where we get the tradition of birthstones from? Deuteronomy 4:19 And take heed, lest you lift your eyes to heaven, and when you see the sun, the moon, and the stars, all the host of heaven, you feel driven to worship them and serve them, which the Lord your God has given to all the peoples under the whole heaven as a heritage. While there’s nothing inherently wrong with wearing jewelry, or crystals by themselves, it is wrong when they are used for healing, as a charm to keep you from harm, or to channel “energies”. The superstitious use of crystals is yet another example of Satan taking what God has created and twisting it for an ungodly purpose. Crystals are a strikingly beautiful example of God’s handiwork, there is nothing magical about them. Using crystals for protection or healing is, at its root, an idolatrous practice. It is idolatry because it depends on spiritual forces other than God for healing and protection; in other words, it is the worship of something other than God. Idolatry is repeatedly and strongly forbidden in the Bible 1 Corinthians 10: 14 Therefore, my beloved, flee from idolatry. 15 I speak as to wise men; judge for yourselves what I say. 16 The cup of blessing which we bless, is it not the communion of the blood of Christ? The bread which we break, is it not the communion of the body of Christ? 17 For we, though many, are one bread and one body; for we all partake of that one bread. 18 Observe Israel after the flesh: Are not those who eat of the sacrifices partakers of the altar? 19 What am I saying then? That an idol is anything, or what is offered to idols is anything? 20 Rather, that the things which the Gentiles sacrifice they sacrifice to demons and not to God, and I do not want you to have fellowship with demons. 2 Corinthians 6:16 And what agreement has the temple of God with idols? For you[a] are the temple of the living God. As God has said: “I will dwell in them And walk among them. Thankfully Jesus will forgive you of the use of crystals if only you ask and repent, turn away from this sin and stop using them. You may need deliverance, but there are many churches out there that can help with that. If you need help finding a church depending on where you live, I may be able to help. The Riddle and the Puzzle in the Bible of the Missing Row on Satan’s Breastplate? This entry was posted in Occult and tagged amulets, Bible, Breastplate of Judgement, channeling, Christianity, crystal healing, crystals, Demons, divination, energy, gems, God, healing, high priest, Holy Spirit, idolatry, Jesus, Kundalini, magic, medium, Occult, pendulum, pseudoscience, reiki master, satanic doctrine, shaman, soothsaying, spirits, talismans, witchcraft. Bookmark the permalink.